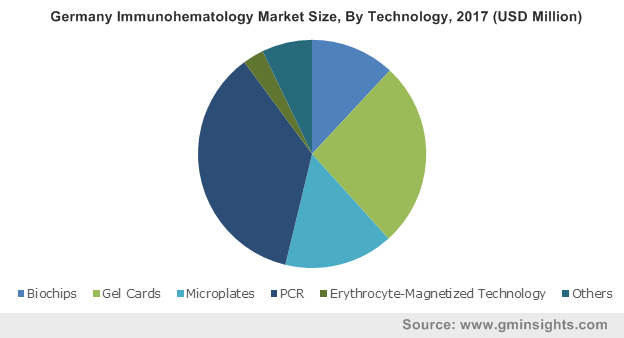 Immunohematology market size was valued at USD 1.8 billion in 2017 and is expected to witness 5.8% CAGR from 2018 to 2024. Technological advancements in immunohematology devices will augment the industry growth over forthcoming years. Currently developed immunohematology analyzers are integrated with advanced technology that enables them to perform accurate and efficient analysis. For instance, immunohematology analyzers developed by BioRad Laboratories provides accurate results and the innovative instrument design enables improved productivity helping to generate quick analysis of the sample being processed. Moreover, key industry players also focus their R&D efforts in introducing semi-automated and fully automated immunohematology systems that further facilitates the sample analyzing process. Reduction in analysis time and minimization of errors due to automation will trigger the adoption of immunohematology analyzers stimulating the industry growth over upcoming years. Increasing prevalence of hematological disorders globally will positively impact the industry growth during forecast timeframe. Most common types of blood conditions include thrombocytopenia, blood cancers, blood clots and anemia. High prevalence of blood cancer will ensure high industry growth over foreseeable future. For instance, according to Janssen, 900,000 people globally are diagnosed with blood cancer every year. There are over 140 different types of blood cancer with varying complexity requiring critical monitoring and availability of technologically advanced immunohematology analyzers will prove beneficial for industry growth as it ensures accurate diagnosis leading to quicker patient recovery. However, stringent regulatory policies may hamper the immunohematology industry growth. Analyzers segment was valued at USD 632 million in 2017 and considerable revenue size can be associated with the increasing demand for technologically advanced analyzers used in diagnosing the blood disorders. Hematology systems integrated with reticulocyte count analysis technique will ensure accurate diagnosis impacting the segmental growth positively in forthcoming years. Also, industry players such as Siemens focus efforts on introducing automation in analyzers that helps in reducing errors ultimately increasing the demand for analyzers. Reagents segment will experience 5.9% CAGR during the forecast timeframe. Superior quality reagents manufactured by companies such as Abbott Laboratories and Beckman Coulter have resulted in high demand. Moreover, high growth will be due to continuous consumption of reagents in detection of blood disorders. Furthermore, increasing prevalence of leukemia in emerging economies will increase demand for immunohematology reagents thereby, escalating the segmental growth in upcoming years. PCR segment accounted for 35.9% in 2017 and is expected to show similar growth trends over the upcoming years. Considerable segmental revenue share can be accounted to the growing applications of PCR in diagnosis of hereditary blood disorders. For instance, according to virtual medical center, currently around 15 million patients have been diagnosed with thalassemia genetic blood disorder that should increase the demand for PCR technique thereby, augmenting segment growth. Biochips segment will experience 5.8% CAGR during the forecast timeframe. Extensive use of biochips in identifying blood group genotyping will boost business growth over the upcoming years. For instance, according to International Society of Blood Transfusion, currently there are around 33 blood groups representing more than 300 antigens and biochips enabling analysis of many tests simultaneously are utilized in determining the complex blood groups. Aforementioned factors coupled with increasing number of blood banks will boost the demand for biochips elevating segmental growth. Hospitals segment was valued at USD 1.0 billion in 2017 and is expected to have substantial revenue size during the forecast timeframe. Significant revenue size can be attributed to the increasing use of immunohematology analyzers in detecting patients suffering from leukemia and other chronic blood disorders. Moreover, automation introduced in the immunohematology devices reduces the chances of errors increasing its adoption among hospitals. Furthermore, development in public healthcare sectors in advanced countries such as U.S. will ensure availability of technologically advanced immunohematology analyzers stimulating the segmental growth. Blood banks segment accounted for 18.2% revenue share in 2017. High preference for technologically advanced immunohematology devices for determining the blood groups while performing transfusion procedures in blood banks will positively influence the segmental growth. According to American Red Cross, in the U.S., around 36,000 units of red blood cells are needed every day and nearly 21 million blood components are transfused every year that should drive the segment growth during forecast timeframe. 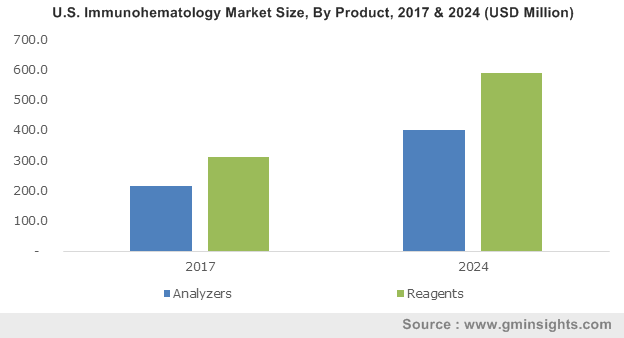 U.S. immunohematology market will experience 5.6% CAGR and is expected to grow substantially during the forecast timeframe. High market growth can be attributed to the increasing prevalence of leukemia. According to Leukemia Lymphoma Society, in 2018 around 174,250 people in the U.S. are expected to be diagnosed with myeloma, leukemia and lymphoma. Moreover, rising awareness regarding genetic testing for blood disorders amongst the American people substantially will increase demand for immunohematology analyzers escalating the industry growth during the forecast timeframe. 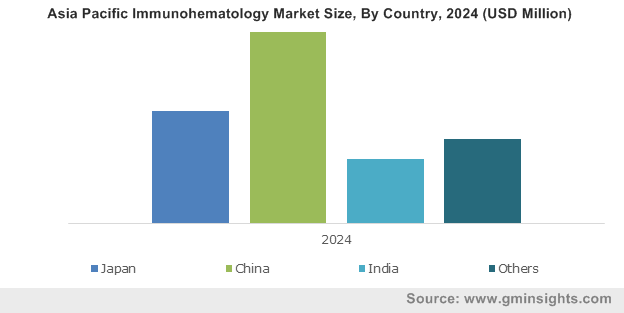 India immunohematology market was valued at USD 68.2 million in 2017. High number of blood transfusions will favor the India immunohematology market growth. According to Red Cross Society, annually 12 million units of blood are required in India that ensures high demand for immunohematology devices that facilitates the process of blood group determination. Furthermore, rising number of blood banks along with growing advances in transfusion medicines will boost the demand for immunohematology devices propelling the industry growth in near future. 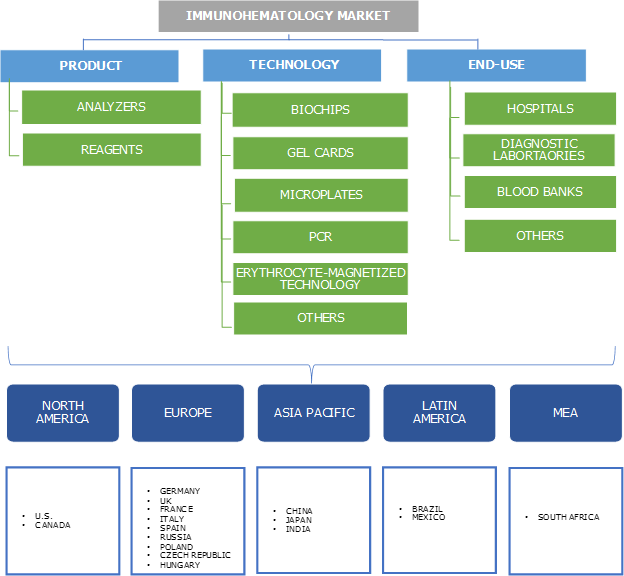 Prominent industry players operational in immunohematology market includes Thermo Fisher Scientific, Beckman Coulter, Hologic, Siemens Healthcare GmbH, Grifols, Ortho Clinical Diagnostics, Immucor, BD (Becton Dickinson), Abbott, MTC Invitro, Antisel, Roche Diagnostics, Bio-Rad Laboratories. These key industry players implement strategies such as collaborations, mergers, acquisitions and new product launch to sustain market competition. For instance, Beckman Coulter launched newly developed PK7300 blood grouping analyser with high throughput of 300 samples per hour. Developing such new systems will render Beckman Coulter with sustainable profits. Immunohematology industry can be traced back to 20th century when principles of immunohematology were introduced. Earlier PCR technology was utilized in detecting the genetic blood disorders and also had potential applications in determining the blood group. Currently, with advancements in transfusion medicine, automated systems integrated with such as erythrocyte-magnetized technology has enabled detection of antibodies with high specificity utilizing microplate method. Newly developed immunohematology devices are fully automated and assure accurate analysis. Furthermore, stringent regulatory scenario will restrain the entry of new players in market by raising the entry barrier. This scenario will prove beneficial for the already existing well-established players. Also, immunohematology industry has numerous growth opportunities and will flourish in the foreseeable future owing to increasing cases of blood cancer in developed as well as developing countries.